US equity indexes closed a little mixed, sp +3pts at 2537. The two leaders - Trans/R2K, settled lower by -0.5% and -0.3% respectively. 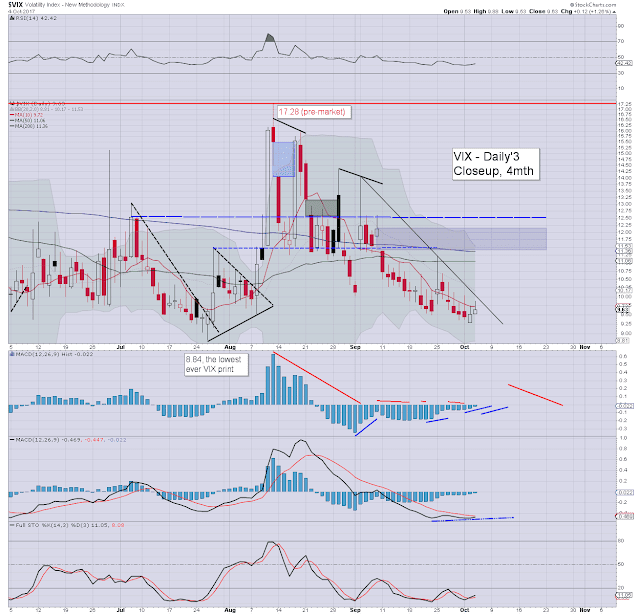 VIX settled +1.3% at 9.63. 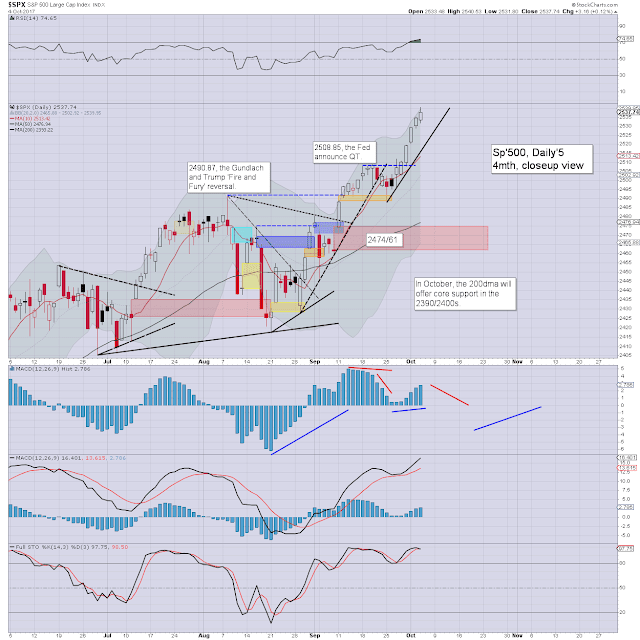 Near term outlook offers the 'technical necessity' of a gap fill to sp'2474/61. 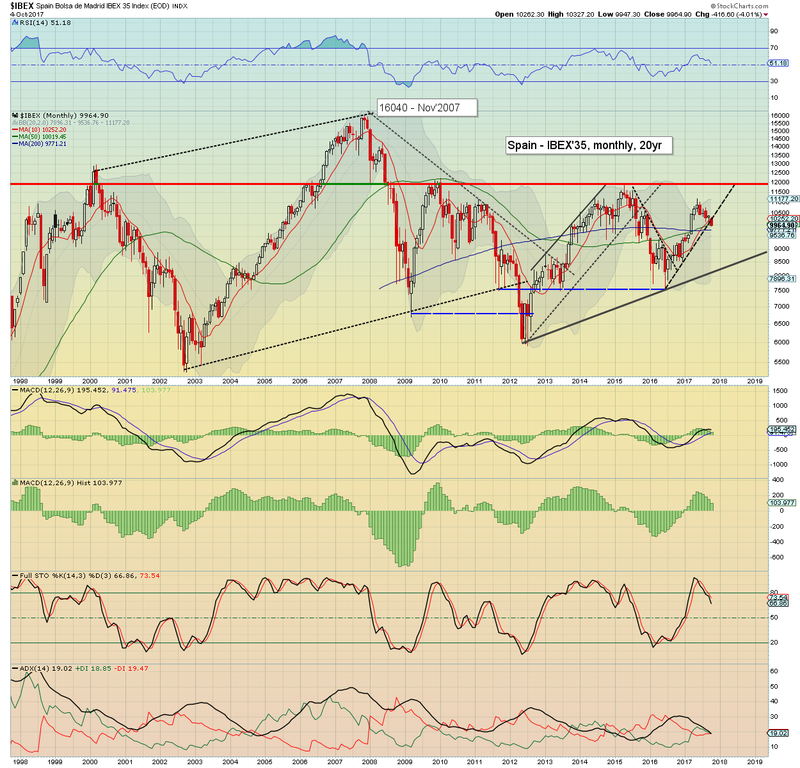 More broadly, the year end target of 2683 remains on track. It was another bullish day for the US equity market, with a sextet of index historic highs. The market is absolutely on the 'cyclically high' side, and we even saw the Transports - which broke above 10k, but settling moderately lower. Market volatility remains very subdued, with the VIX stuck in the 9s. If sp'2474/61, that really should equate to VIX 12/13s. The key 20 threshold looks out of range unless something 'horrible' in the western pacific. or... they fight it out. Its really that simple. Just yesterday the Spanish King was rolled out to declare how the Catalonians were being disrespectful to the power of the state. Anyone with even a modicum of European history, will know how there are underlying societal fractures that date back centuries. They never went away, despite what some wish to believe. The UK is leaving the EU, Scotland will likely initiate another vote to split from the UK, I could go on. You know where its headed, right? As a final note, should we not expect the Catholic church to soon issue an official policy/view on the Catalonia situation? Does nobody in Catalonia expect a Spanish inquisition? Ohh, and none of this can be bullish for the Spanish equity market..
Today's drop of -2.8% to 9964, is a decisive technical break. Next support is 9000, then 8250. 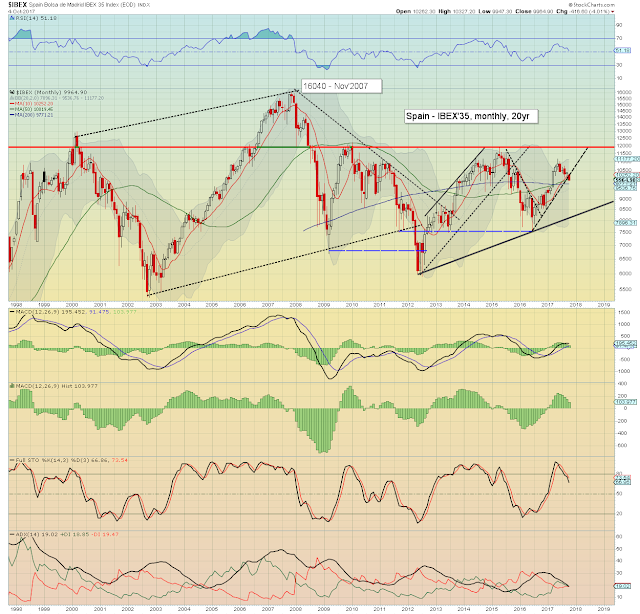 S/t bearish.